Last weekend we reported that "the world's most bearish hedge fund", Horseman Global, had charted a specific path to trade the coming bear market, and it went through one commodity - oil, and one industry - shale. As Clark wrote in his most recent Market View letter, data from the EIA, price action of stocks, and comments and capital market activity "are all pointing to the oil industry beginning to move away from US onshore. Not in a huge way, but a bit" He then added that when looking at the "brutal and unrelenting economics of US shale oil drilling", Clark predicted that US oil production would slow and quite possibly contract. Aside from specific sectors, a slowdown in US oil production and a rise in oil prices, would also have broader economic implications and cause a sharp slowdown in US growth. For now, this thesis has yet to pan out at the macro level: in fact, as Bloomberg wrote overnight, North American oil and gas producers "are delivering the wrong type of growth" in terms of both what investors, and Horseman, is expecting: too much production, not enough cash. Earlier this year, many shale explorers pledged to change their ways, reducing spending and returning more to shareholders. Dividends and share buybacks were the major theme of the first quarter, but then many companies blew through their capital spending budgets in the second quarter. Third-quarter earnings will reveal whether the industry can adhere to its much-touted plan for financial discipline. The main reason for this is that while pipeline constraints have hampered production from the Permian, companies haven’t stopped drilling resulting in a skyrocketing number of wells awaiting completion and foreshadowing a production deluge - and lower prices - once the pipes are ready next year. Just as concerning is that while companies blew out their capex estimates, and many expecting to boost their capital spending budgets further next year, they have been unable to produce shale on a regular basis. 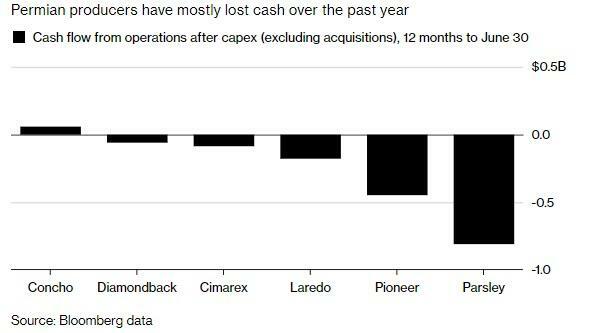 In fact, at a time when shale producers should be rolling in the green, 2018 has been far from great, at least in the Permian, with many companies burning through cash in the past 12 months. 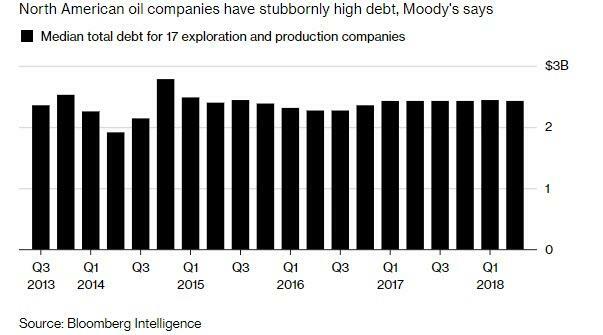 Meanwhile, having learned little from the 2015 near death experience for many shale companies, despite the rebound in oil prices and commitment to restrain spending, oil companies’ debt levels remain little changed since 2013, according to Moody’s. These trends came to a head on Monday when troubled shale company Weatherford posted a quarterly loss and missed its target for free cashflow, sending its stock tumbling and bonds plunging deeper into distressed territory, while pushing energy junk bond spreads wider. 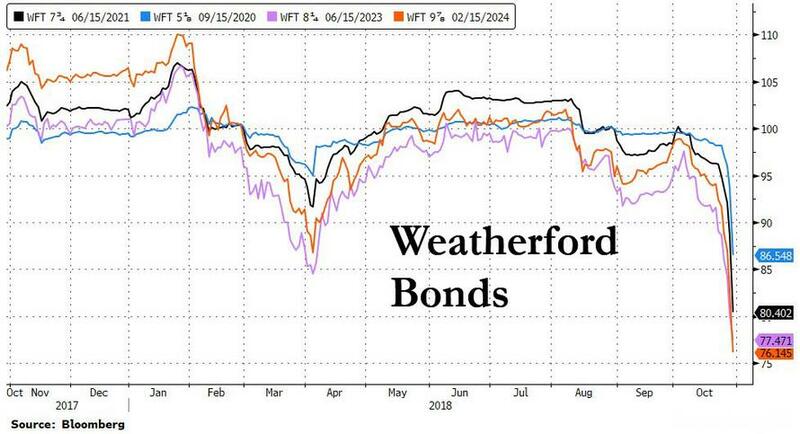 As Bloomberg notes, citing CreditSights which cut the company to underperform, Weatherford and its peers face a slowdown onshore in the U.S., as well as lower oil prices. As a result, the whole oil and gas services sector is wider, especially the lower-rated bonds, with the Barclays High Yield Energy Index spread blowing out to 452bps, the widest since September 2017. 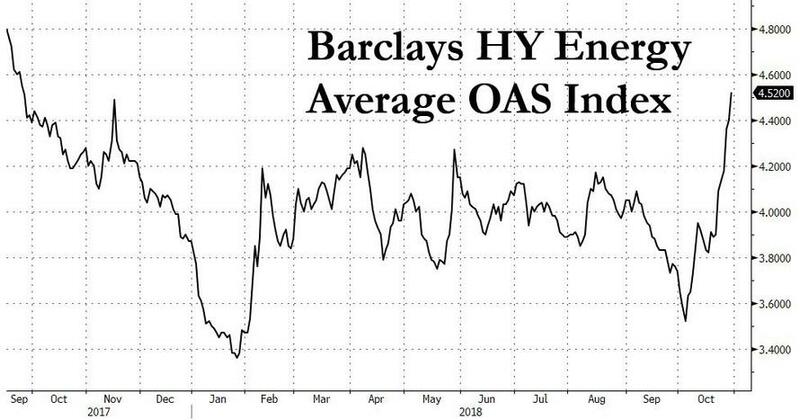 This was the biggest one-month move wider in energy HY spreads since the E&P crisis of December 2015/January 2016, when energy junk bonds blew out, as many shale companies defaulted on their debt. 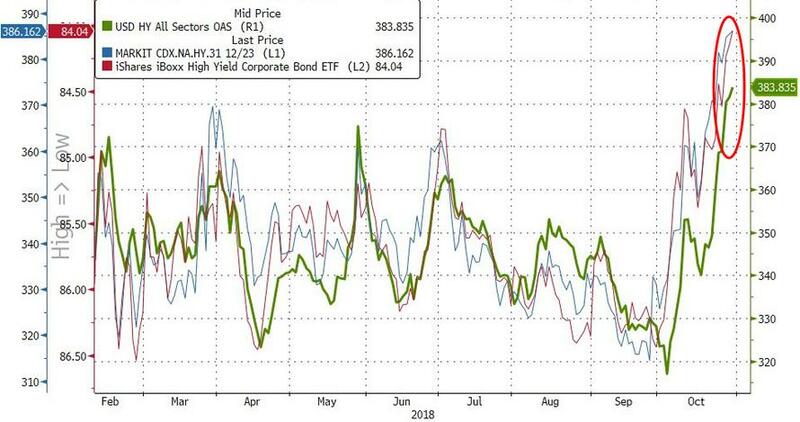 And as energy credit is suddenly reeling, the weakness has spread with credit markets continuing to crack wider as cash markets catch up to derivatives, and the junk bond index now back to levels last seen in November 2017. And with oil prices having peaked and sliding to 2 month lows, with cash flows in the red and with sticky debt refusing to shrink, how much longer before the woes in the oil patch - which have already sunk the bonds of several distressed names - spread to the broader market and shake the one asset class which until just a month ago had confounded so many traders with its perplexing immunity to any bad news.